The first total lunar eclipse of 2015 will begin Saturday, April 4th at 6:16 a.m. EDT (3:16 a.m. PDT). You’ll want to be prepared; totality will last just four minutes and forty-three seconds (! ), making this weekend’s total lunar eclipse the shortest of the 21st Century. Here’s how to make the most of the experience. ...and What’s a “Blood Moon”? It’s possible you’ve heard Saturday’s eclipse referred to as a “blood moon,” which, sure, sounds cool, but the term actually has religious origins (insofar as they are evidently relevant to biblical prophesy), not an astronomical one. 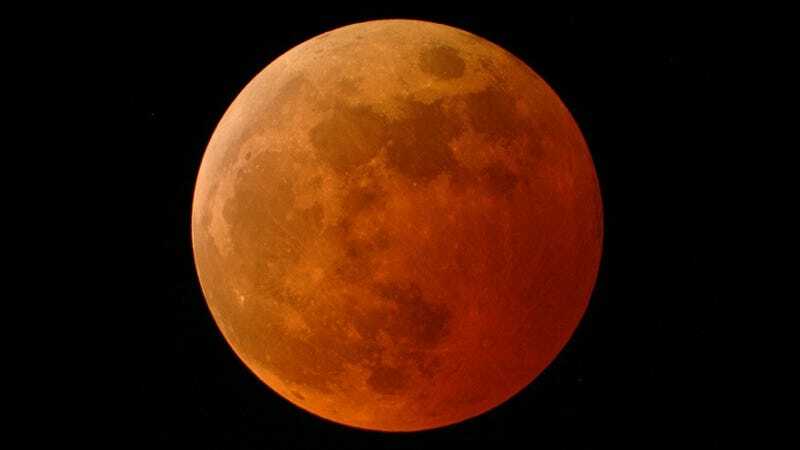 As the good folks at EarthSky put it: “We can’t really tell you why more and more people are using the term Blood Moon to describe the four full moons of a lunar tetrad. We don’t know why, exactly.” As for why the moon appears red when completely covered by Earth’s shadow, the NASA video above provides the genuinely awesome explanation around the 3:00 mark. In you’re in North America, the best time to watch the eclipse will be early morning Saturday. If you’re in the Eastern Hemisphere, the best time to watch will be Saturday late evening, after sunset. Your total viewing window will be about three and a half hours, but remember: the moon will be fully enshrouded in Earth’s shadow for just under five minutes. If you want to witness totality, be sure to study the following times closely. The eclipse will begin April 4th at 10:15:45 Universal Time (that’s 6:15:45 AM EDT / 3:15:45 AM PDT), when the Moon enters the western edge of Earth’s umbral shadow. The umbra is a region where Earth blocks all direct sunlight from reaching the moon, and is the darkest, innermost portion of the shadow cast by our planet. The most dramatic views will arrive at 11:57:54 UT (7:57:54 a.m. EDT / 4:57:54 a.m. PDT), at the start of totality. This is the deepest stage of the eclipse, and will last just four minutes and forty three seconds – the shortest of any eclipse this century – ending as the moon emerges from the eastern edge of Earth’s umbral shadow at 12:02:37 UT (8:02:37 EDT / 5:02:37 PDT). Competing with poor visibility? You can always watch online. Slooh is always a safe bet for events like this. Their coverage begins Saturday morning at 6:00 a.m. EDT / 3:00 a.m. PDT. NASA will be hosting live coverage, too, broadcasting live from Griffith Observatory in Los Angeles beginning also at 6:00 a.m. EDT/ 3:00 a.m PDT. NASA will also host a media teleconference at 1 p.m. EDT on Friday April 3, to address questions about the eclipse. A version of this guide appeared in April 2015 in the leadup to the first eclipse in the lunar tetrad.